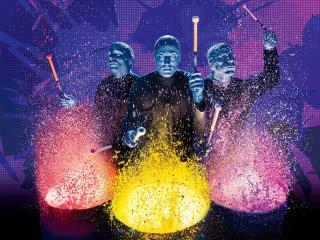 Redefine entertainment with Blue Man Group at Universal Orlando® Resort. This world-renowned show is a curiously captivating mash-up of totally unique live music, unexpected humour, and lots of paint! People of all ages agree: Blue Man Group is a totally outrageous experience—and the only place in town you'll find a show as astounding as this is at Universal Orlando® Resort. The Blue Man Group Orlando show is performed daily throughout the year at the Sharp AQUOS Theatre, in Universal CityWalk® and lasts around 1 hour 45 minutes. Show times vary from 6.00pm to 9.00pm depending on the time of year - see calendar for details. The Blue Man Group Arena is broken down into 2 main sections – Tier 1 and Tier 2. Seats are allocated on a ‘best seat available’ basis and the majority of Blue Man Group tickets will be in the Tier 1 category. All seats enjoy excellent sight-lines.